As of yesterday both the UT Texas Orator, which has launched a Change.org petition, and the Texas A&M Battalion have published our Open Letter to Congressman O'Rourke and Senator Cruz calling for debates at UT, A&M and Sul Ross State. We talk about budgets and deficits, the debt, healthcare, privacy, defense, a host of other topics before we ran out of time. And for the record, the "We Don't No Stinkin' Budgets" title refers to the attitude of our current Congress. 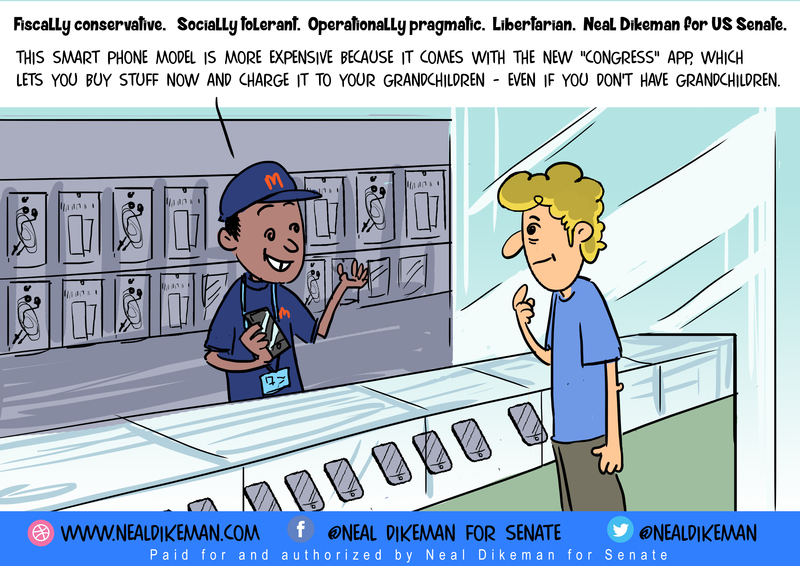 To quote Bitter Truth host Abe Abdelhadi, who like Congressman O'Rourke is in on the record favoring single payer healthcare, which I do not, after he heard Congressman O'Rourke had ignored a call to debate me - "Listen to this Neal Dikeman interview! He'll obliterate O'Rourke." Ask Nominee to walk through their background in their own words, and explain why they believe they are qualified for this position, why they believe they are more qualified than the other candidates, and why they believe they were nominated, giving specific examples and evidence. Ask Nominee to elaborate, regardless of age, since we appoint them for life, under what circumstances and how would they evaluate when they are no longer able to effectively serve, and tender their resignation, and as their cognitive abilities, like all of ours, will decline with age, how will they offset this in the time while they do serve. If I could amend this process in 1 way, I would argue for a Constitutional Amendment calling for 14 year terms or mandatory retirement age for all Federal Judges. Our founding fathers lived in a world of much lower life expectancy, and did not, in my view, envision a court where octogenarians ruled the day. Pass out copies of the US Constitution. 2) for each, give and provide an example of a time when they ruled on that clause, or if they've never ruled on that, argued concerning that clause, the arguments presented on both sides, their reasoning, the end result, and anything they'd do differently today, or might do differently if they were a SCOTUS Justice on the highest court in the land. 2) Summarize whether they would have joined the majority or dissenting opinion in that case, and why, or provide any changes they would have made to the majority opinion had they written it. Ask Nominee to elaborate on 3 court cases, and 3 times in personal life, where they have taken an action or stance to protect or help someone in need, stand up for what was right, defend the Constitution, or serve justice, when the they knew doing so would, and did, have a material adverse impact on themselves personally. Ask the Nominee to describe and explain their worst no win, Solomon and the baby case, what made it their worst, and how and why they ruled, and what they would do differently now, or on the Supreme Court, and what the outcome was. Ask Nominee to elaborate 3 court cases where they ruled according to what they thought the law required, when they believe justice was not served, and explain if they would rule the same way today, and would rule the same way if on the Supreme Court. Ask Nominee to summarize their understanding of changes in the court's precedents over the years, and provide examples of 3 times where they ruled in ways that overturned or might have seemed in conflict with prior precedents, what considerations they use in general, and used in those cases, before making a decision that might change precedent, considering that another judge who received the same vetting that they did, came to the opposite conclusion. Ask Nominee to point out 5 recent SCOTUS cases where they believe the majority opinion was not correct, and how and why they would have ruled differently. Ask Nominee why they want this job, to describe with whom and what discussions they had in the vetting process, and the path and circumstances that led to their nomination. I do not believe advise and consent means rubber stamp, nor do I think that pure politics should decide the outcome. In a nation of more than 300 million amazing Americans, just because the President happened to pick you, doesn't mean I owe you my vote. Recall that Chief Justice John Marshall, the man who defined the Supreme Court, was homeschooled and did not graduate college. 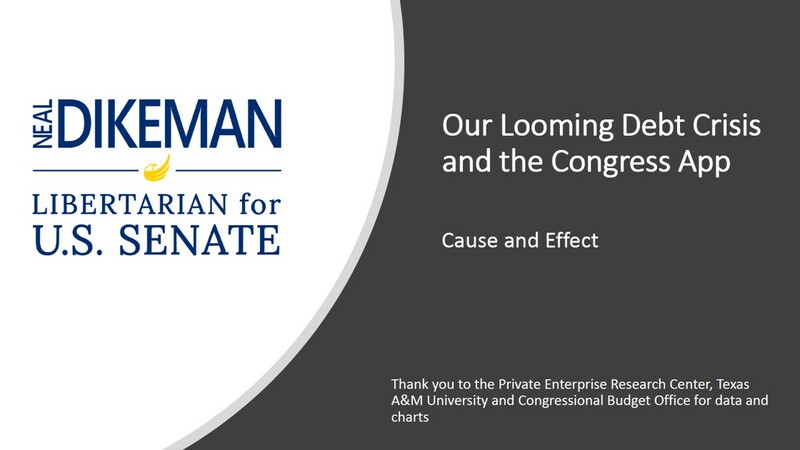 We have put together a summary, using Private Enterprise Research Center, Congressional Budget Office, and our own internal research, of the growth of the Federal Debt, including both nominal debt, and "off balance sheet" totals. The challenge we face is the debt total now equals $43 Trillion, equivalent to $341,000 per household in America. Half of that is unfunded entitlement liabilities, largely Medicare and Social Security. The nominal debt alone is at levels only reached in wartime during WWII, and worsening fast. It's equal to our whole economy. The unfunded Social Security and Medicare is again the same size, and also getting worse. Solving this matters to both our young, who have gotten the can kicked down to them, our workers and companies, who face potential higher taxes down the road to pay for it, and our senior citizens, whose Medicare and Social Security are at risk from inflation, taxes, and benefit cuts, if we delay solving it until too late. I have made out of control debt a major campaign issue, as I am not ok with anyone kicking the can down the road to by 3 and 5 year old daughters. And not ok risking our retirees financial future so our politicians can spend more money to stay in office. The spending gap, debt and deficits have simply worsened under an all Democratic Congress and White House, under an all Republican one, and when split. Both deficits and spending have literally gone up in every major category, every year since Beto and Ted got into office. 20% in total in the last 6 years, before the next spending increases. Have you gotten 20% more income? The icing on the cake: The spending plan and tax cuts our elected officials just signed us up for - is another $12 Trillion in the next 10 years in deficits. That's averaging 20% of total government spending, equals $100,000 new debt per American family, and is larger than the entire GDP growth in that decade. Regardless of whether you are Right, Left, Libertarian, or Independent - this has to be fixed. The "small government" "fiscally conservative" Republicans railroaded the tax cuts through no purposes days before their own accountants could finish the analysis showing how bad it was. Republicans voted for the spending increases as well. And no Republicans - you can't grow your way out when you add debt faster than you add GDP. And no Democrats, single payer healthcare isn't the answer when you aren't even fully funding our retirees' retirement and Medicare today. You have no moral right kick the can down the road to my daughters and dump your debt mountain on them before they start in life. Bitcoin, the largest and original cryptocurrency, ended the first half down over 70% from it's peak. As many as 1,000 different coins are now functionally worthless. Why does this matter to Libertarians? Well, cryptos do matter to Libertarians. For starters, every Libertarian should read the original paper inventing Bitcoin and explaining BlockChain technology. The appeal of cryptocurrencies includes that the blockchain technology they are built on is peer to peer and needs no central authority - potentially making them and other blockchain based solutions what I call GIP, "government idiot proof" or "government involvement proof". They become a non governmental digital currency enabling financial transactions between private parties independent of monetary policy or capital controls of one or more nations, and even independent of the companies or organizations that helped spawn or manage them. Better yet, they are unbelievably democratic as well as decentralized - 5 Texans in Marfa or Houston can start their own, the underlying blockchain principles are free and easy to replicate - though the technology to implement them is more complex and expensive. It literally is make your own "NealCoin" if you want. That's why there were 1,000s of them in such a short time. The UT/Texas Tribune poll, generally regarded as the gold standard for a Texas political polling, showed a strong showing for Libertarians in early results, improving on 2014. The tightest Libertarian race is US Senate, where Libertarians set a record in 2014, but where the current Democratic candidate is raising more money than all other races combined, and making the strongest showing, and strongest for Attorney General, not unexpected, as Libertarians usually perform best statewide in judicial and commission races. Mr. Sanders you are nuts. You may be the most popular politician in America, but there is nothing intelligent about a program to guarantee jobs. Millions more job postings than new jobs created are not fake news. We have 5-10x as many job openings as jobs created in America. Let's start with our common ground. I, along with most Americans, well understand that growing income inequality is a concern - and I want this world to be a better place for my daughters - full stop. And I expect to live in an America where every individual and each family can support themselves, and afford healthcare, food, housing, and feel like they have a voice and equal opportunity. But unlike you I believe the government does not solve these problems, its citizens do, and when it is needed, my local and state government is a better place for citizens to solve problems than letting a Vermont Senator take money from Texas to solve it in Washington for 50 states. You are proof of that. You are a sitting Senator, and have been in Congress since I was in middle school. You participated in creating this inequality - supporting easy money policies of the past two decades, shifting value from wage owners into investors, and out of retirees hands and into the hands of banks. You exacerbated this by helping drive a healthcare policy that focused on coverage, not cost, driving precious wage growth into the hands of our healthcare sector instead of our workers, and have left our workforce still unable to easily leave jobs, start companies or change states to get work without risking their families' healthcare. And by irresponsibly driving up our deficit and debt, you've taken money out of the hands of our government and citizens, and left us with no dry powder left to deliver this or any other agenda. Your failure to deal with the aftermath of financial crisis, and student loan crisis - enabled by an easy loan policy helping create skyrocketing higher educational costs, and a bad subsidized Federal mortgage policy - have left a nation, and worse a whole generation, with less labor mobility and fewer options than at any time in US history. In fact, your family benefited financially from that. And now you want to "guarantee" every American a job, not just make up a minimum wage? Mr. Sanders we currently have $341,000 in federal liabilities for every household in America, nearly twice the average American mortgage. Our current Congressionally approved budget will add another $100,000 in debt for every family by the time by 5 year old gets to high school. You are asking us to write checks our body can't cash - because you already cashed them - yet your generation which benefited from this borrowing won't be around in decades to pay the piper. My 3 and 5 year old daughters will. You do not get to rob their future to pay for your ideas and stay in office. I am running against Ted Cruz, and challenging everyone like you and him - because my daughters are 3 and 5 and don't deserve this. Lost in the saddening debacle about newly enforcing an old policy to separate children of illegal immigrants from their parents at the border, is a single crucial point that we need real immigration reform - badly, and now. Congress can address the awful specter of an America so divided by immigration that we let this happen, and let ourselves be defined by viral images of children separated from parents, simply by passing a good immigration law, and replacing what we have. Yes, it will have to be multi-partisan to get it done. Yes, it is likely that no party will be perfectly happy. But it is obvious that our current immigration laws are not working, and make no one happy. Yet neither the Republican nor Democrat parties have been willing to step up and risk the wrath of their primary voters by getting their job done. On immigration reform Congressional head in the sand has been going on for literally decades. This is happening in Texas, our elected Texas Federal officials need to step up. More saddening is the fact that the reason this policy is coming up today, is that the Republicans are using it as a pretty basic negotiating 101 tactic to bring the Democrats to the table to vote on Republican border control issues. And the Democrats are taking the bait. I want a fix that will last for generations. Not an emergency bill that just funds more border control ahead of the midterms, and or let's the Democrats get a DACA "win" at the expense of real immigration reform. Our legal immigrants, our businesses, and those who seek to join our amazing country, deserve a bedrock, well considered, multi-partisan law that makes sense, and won't be gamed by politicians on either side of the aisle for elections. People migrate to the US today for the same reason my family did generations ago, opportunity for their children. I am thankful mine took the risk. We should all take a moment and be proud that our neighbors respect what we have built, rather than complaining about what we don't like. I for one would like to see more legal immigration. If we think we are going to bring manufacturing back, grow our tech and energy sectors, and keep up our vaunted status as breadbasket to the world let alone manage our debts with no immigration, we need to look in the mirror and consider the lessons of the Japan experience. If we think we will out compete China and Europe by closing our markets and borders, taking our ball and going home, or can just go back to 1955, we should remember the world does not stand still. America is both a nation of compassion, of immigrants, of opportunity, and a nation of laws. There is literally no one in favor of separating children from parents. I cannot fathom that either side in the debate believes the current outcome is acceptable or the best we can do. But that is how we come to this point? Texas, as one of the largest immigrant gateways to America, a largely conservative state, a huge ag state and a border state with a huge immigrant population and voter base - needs to lead on immigration reform. No one else is. You've heard the proverb, what's the best time to plant a tree? 20 years ago. The second best time? Now. It is fascinating how many times I have been told that a vote for me is a vote to help, flip a coin, either Ted or Beto, depending on the commenter's fears. Exhibit A why we are running. You should not have to cast a vote because they are afraid the "other guy" might win. I do not cast my vote now, nor would I as a Senator, based on what other voters have or might do. I am not asking for your vote, or your kudos, I ask that you read my positions, listen to my message, and vote your conscience on November 6. Every one of us has complained that we need better choices for our politics. Now you have one. Time to step up, stop complaining that you're afraid of giving voters a choice. I am frankly tired of being told by Republicans, "Ted believes in shrinking government. We shouldn't vote against Ted, because he's only one of 100 Senators, so he can't be accountable for Congress' failures and rising spending and deficits". My response, there are 28 mm amazing Texans for 2 Senate slots. If he can't get the job done, I am quite sure we have some great replacements in this state. If you don't like my policies, write in someone you do. #TedCruz ought to be more afraid of me than #Betofortexas. If he wants to ensure he beats #NealDikeman or Beto all he has to do is start listening to the average voter in Texas and not his own safe echo chamber. Or from the other side, I'll siphon votes from Beto and keep Ted in office. In Texas, no Democrat has won statewide in over two decades. Democrats don't need to be afraid of me siphoning votes away, first they have to actually have policies that will attract them. Beto is not going to knock off an incumbent Republican Senator while running in Texas as a far left single payer healthcare, raise the minimum wage, anti-gun, pro national service progressive. If he wants Texas, he can come after my voters in the middle as well. I am excited that he is turning out media and making this a race. The last Democrat Senate candidate in Texas got blown out by 26 points and no one remembers his name. But if he has a chance, it's because Ted and he are ceding the swing voters in moderate middle of Texas to the Libertarians, and I'll make it a race. Oh, newsflash, that means I have the same chance. That massive quiet, fiscally conservative, rational, tolerant, community serving caring hardworking base in Texas that believes in personal property rights, personal liberty, privacy, accountability in your home and your government, and keeping us out of unnecessary foreign wars? It votes. And not for left wing policies. Of course, they are also really, really tired of the hate, dysfunction and out of control spending from the Republican party, too. I'm a 6th generation Texan. My daughters will grow up here, and my family will be here in another 150 years. We take the long view.